Well VUE works really well for my Sagan 4 taxonomy cladograms. I would think it could do family trees just as well. Also its free to download so everyone could make their own family trees. Also its super easy to use. 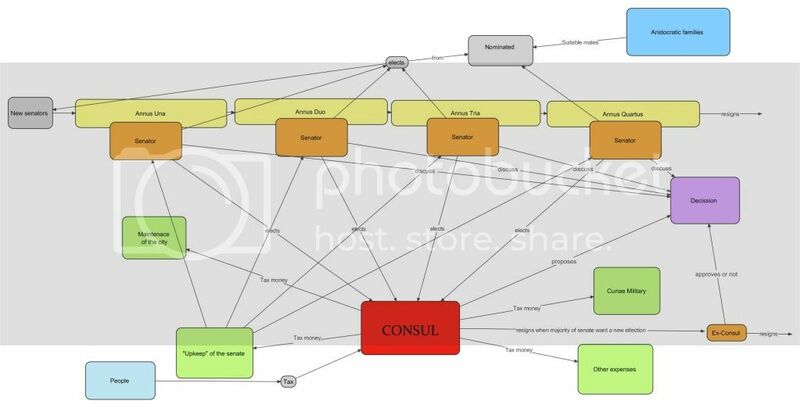 Its great for flow charts, tech trees, etc. I plan to make my own family tree using VUE once I post my stuff. Whoa, that is really good, thanks Hydro! I wonder why wine goes both ways with the countryside. 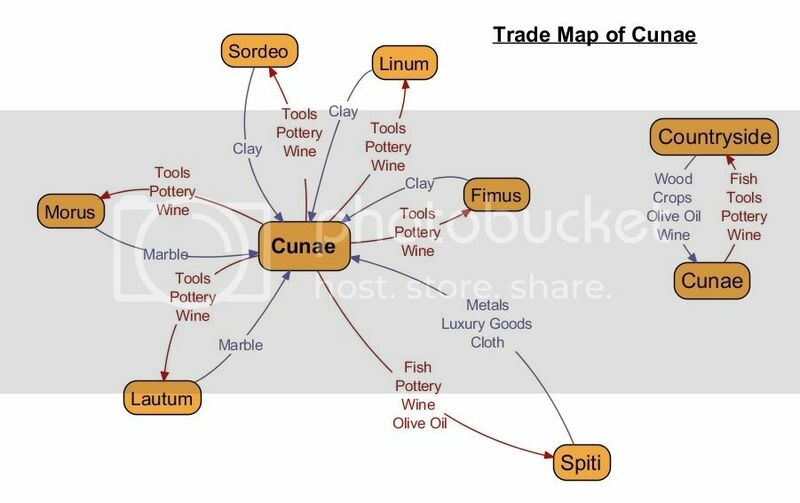 Yea, that is a misstake, wine is not produced inside Cunae. EDIT: Regarding the test RP, I don't think Josasa planned to host the festival at his house, but as it seemed as if Little asumed that I went with that as well. Oh, damn, my bad. Still, a villa is an excellent place for a high-class party. Maybe this is where the nobles are just meeting before they head out to the festival? Either way, I guess it works. Sorry that I am slow but here is my stuff. Picon started out as a fisherman. However one day his future wife Caprica was coming into port on a transport ship. But there was a huge storm and many boats were lost in the storm. Picon who was heading back to the docks on this families fishing boat was brave enough to dive in after Caprica's boat. He saved her and her father. The rest of her family died that day and Picon was rewarded by living with them at their estate. Over the years Picon and Caprica fell in love and her father while reluctant at first had grown very fond of Picon and eventually willed him all his land when he died. Picon has 7 sons, all from his wife Caprica. Caprica comes from a family of wealthy land owners. Caprica is a loving mother who over spoils her 7 sons and lets them do whatever they want. Most of the land her family owned went to her 7 sons, who have since demolished what homes were on top and replaced it with their own entrepreneurial visions. All that's left of the original buildings is their estate in which they all live in. Tauron is the 1st born son of Picon and Caprica. He has a quick temper and is very aggressive. He enjoys the suffering of others and watching battles. He bullied his brother Leonis into having gladiator fights in Leonis' the amphitheater. He now trains train gladiators to fight there. Seeing them fight quench his blood lust through gladiator sport. He is married to Libra and has a son Sagittaron. Gemenon is the 2nd born son of Picon and Caprica. He is a greedy and has a silver tongue. He loves gold and gems. He used his land to build a lavish gambling hall. He is too smart and loves to trick other people out of of their money and goods. He is married to Ophiuchia. Virgus is the 3rd born son of Picon and Caprica. He is the ladies man who cannot get enough women. While not married he has a whole harem women. He used his land to build a brothel and has exotic women from far away lands. He is quite the night owl and loves to party late into the night and sleep with many women. Leonis is the 4th born son of Picon and Caprica. He is in love with himself and his accomplishments. He is a complete over achiever, however he cares little for others. He is smart, athletic and handsome. He uses his land to build an amphitheater in which he stars in all of the plays no matter what. He is one of the most well known members of the Skandalon family. Aries is the 5th born son of Picon and Caprica. He is very fat and loves to eat. He talked his brother, Gemenon into building a restaurant in his gambling hall. That way they would stay longer gambling and some o f the money they won would be used to pay for food. Gemenon loved the idea and so it was added. Aries he spends most of his days there eating at his own private table. Scorpius is the 6th born son of Picon and Caprica. He is extremely lazy and hates doing anything himself. He has the most servants and slaves of all the the 7 brothers. They even carry him around on a seat so he will not have to walk from place to place. Canceron is the 7th born son of Picon and Caprica. He being the youngest he has just finished school is not quite sure what to do with his life. He wishes he had the stuff his 6 brothers have and resents them for their success, especially Leonis. He has no land since they never expected a 7th son. He resents them for this. Libra is the wife of Tauron. She is a beautiful and strong willed woman who grew up in the barbarian lands. She grew up knowing how to hunt and survive in the wilderness. It was when Eros's servants captured her for his brothel that Tauron pulled her aside and wished to have her has his wife. Now part of the aristocracy she hates wearing fancy clothing and jewelry. She however enjoys watching the battles in the amphitheater with Tauron. She has one son named Sagittaron. Ophiuchia is the wife of Gemenon. She was won in a gamble that her father could not repay. Her father was a wealthy olive grower, however rather than loosing his land he gave up his daughter, who was suppose to marry another man. Athene is a very spiritual woman and almost became an oracle. Gemenon uses her skills of prophecy help increase his wealth. She doesn't particularly like him but knows if she goes back her father will loose all of his land. Aquaria is the wife of Leonis. She is a beautiful actress who has become more or less the Leonis trophy wife. They met when Leonis in the first year that his amphitheater opened. She has beautiful voice and a hot body that brings all the men into watch their plays. She is deeply in love with Leonis, even though he is more in love with himself than her. She comes from a family of artists, musicians and actors, most of which are hired to keep the amphitheater maintained. Sagittaron is the son of Tauron and Libra. He is quick and athletic like his parents. He is the fastest runner at school and seems to never tire. His parents are very proud of him and encourage him. He is tall and has long legs help him run. He is also thin despite his huge appetite. He can be found running to the Gambling Hall / Resultant after school so he can sit with his uncle Aries, eating just as much as him. I think it comes out to exactly 1000 points. Let me know if I need to change anything. I tried to focus more on the personalty and sticking with the 7 deadly sins theme for each of the 7 brothers. In addition I tried to find Greek names that bet fit their personality. I was going to use Roman names but the Greek ones sounded better. EDIT: I wrote this stuff up before I saw your map. I am not sure if you want them to own the coliseum and amphitheater on the map or have them add their own private versions of it. In short I hope they get to keep the stuff I wrote about since it really fits their "7 deadly sins" personalities. I didn't initially intend that, but it works just as well. Makes things a bit easier then. A smith and a carpenter isn't really an aristocratic family. I am sorry, but this game is about the power play and the politics in an aristocratic state and there'll be enough players controlling the aristocrats, I don't need more players controlling the employees of the aristocrats. The people of Cunae are comparable to romans / greeks. If you want your family to have other origins, then think close to rome at least, and do not mention to much details about this foreign homeland as it might conflict with the game. I have seen your concerns and edited accordingly. Hope it's good now. I will keep trying, you know. Your family is still very small. Also, you're not allowed to just declare yourself as being a politician. Furthurmore, all the bios are very shallow and not particularily well thought out. You should put a bit more effort into it. Also, Hareta seems to be a bit of a Gary Lou, even without you not having written much about him. There is no reason why he would be a theif. Yeah, your bios are 1 sentence each. And a small family tends to have less money and therefore less standing. Well I could have used their Roman names like Mars instead of Ares. I almost gave them Zodiac names though. Your welcome. I love that program. Nice job on your own flow chart. It looks great! 1. Cunae hasn't got much of a navy at all, yet. 2. A fisherman marrying an aristocrat seems wierd as the fishermen are as low class as you can ever get. It is possible though, but would bring bad reputation to your family. 3. I can not allow you to build a coliseum just like that. I might consider giving your family the theatre though, but don't take it for granted as it is a big income. 4. It seems as if your family builds a lot. Do you mean that they build outside of Cunae? Because inside the walls there aren't much room so they would either have to tear down some old estates or rebuild them into whatever. 5. Not really an issue, but misspelling chefs as chiefs gave me a laugh. 6. I am not sure the type of restaurant you refer to actually existed back then. @Dr.Octagonapus: Martyk pretty much summed it up. I'd also recommend you to say Outer Cunae and not lower Cunae, as well as putting the family name after the given names. What do you suggest I do then? I mean I would assume that other lands would not have much of a navy either. So him winning battles with a small navy would be impressive right? Like I said his impressive skills as a war hero showed that even a fisherman can become successful and change their class. If anything he would be quite popular among the lower class I would think. A success story if you will. I mean really you wanted to have characters that stood out from the commoners right? Extraordinary people with interesting lives. Going from rags to riches is his whole hook. If you take that away he is just some fisherman. And that doesn't make much of a story. Ok what about if I changed it to him owning gladiators to fight in the coliseum? And even donating wid animals for the shows? Sort of a patron of war sports? I would say that they would tear down old land that Hera's family once owned. Though things like maybe the brothel or the undeveloped land of Hypnos and Phthonos could be located outside the city if you want. Likeswise some things could still use old buildings such as the restaurant, gambling hall or even the brothel. Really the only thing that would need to have anything torn down would be the amphitheater. Oops I do that a lot. I will fix. What do you mean? There were sit down places to eat back in roman times. Sure they did not have refrigerators or microvaves but they had just about everything else including running water. What's wrong with the god names? Those are Greek names. People name their kids after gods all the time. I know someone named Athena and then there is Hermes Conrad on Futurama! In addition i have also heard of people named after gods in the Roman style such as Mars, Venus or Juno. It also took me forever to look up appropriate guy names that were also Greek god names. I recommend you to do some serious reworking of your family. Like what I through I thought I did well. Much better than my AtoC submissions. I mean besides not having control over the coliseum what was particularity wrong? I thought each character was quite unique from each other. It may be because I don't RP much but I have really grown fond of my 13 character I submitted. Your characters are different from each other, that doesn't mean they are unique. The fact that you based each character of one personality trait makes them very one sided and it's hard to feel the characters as they just seem unrealisticly naive to everything but their one passion. The character I really liked though was Artemis, she was something unique and had a background story that could make you understand her possition. By the way, there is no coliseum in Cunae. There's the theatre sure, but that is quite far from a coliseum. I still say no to a navy warhero, if you look at the dock of Cunae in the picture I posted you see that it is just small fishing boats and nothing more. 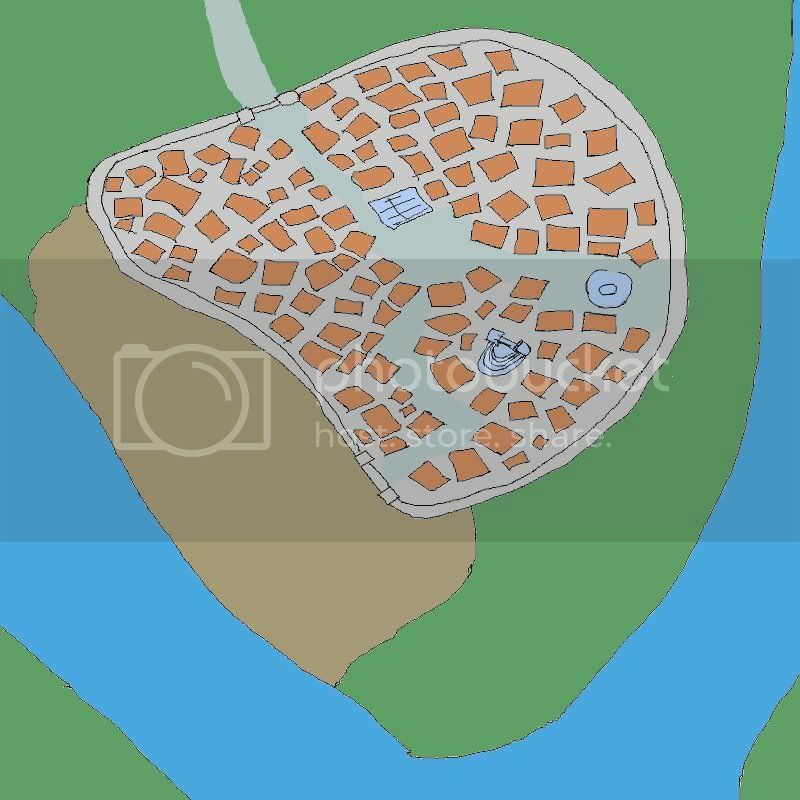 Another issue is that you give yourself so much land, I think you'll have to cut down on how much you build or own in Cunae if you want any villas to live in left. Having a family where the majority of the members have god names is somewhat cheesy and unimaginative. I agree that it is a problem that you do not RP much. It was a problem in AToC that we discuessed repeatedly, and that game was even less based on RP than this will be. I am affraid that you have to prove that you indeed CAN RP good enough to not disturb the flow of this game. A newly elected senator sits in the Annus Una section for the 1st year, then the Annus Duo section for the 2nd year and so on. When his 4th year is over he is automatically one of the nominated for the new Annus Una senators if he does not object. Others aren't offically nominated, but commonly most senators base their votes on social standing or wealth and power, as well as personal reasons. The senate meets when the Consul calls for a meeting. The senators can also call for a meeting but at least 12 of the total 16 must then apply for such a meeting to the Consul. The same applies for the election of a new consul. The Consul is obligated to anounce how he spends the tax money, so most meetings are just that, anouncements. He may also propose an important decission that the senators discuss. If 12/16 or more does not oppose the decission the Consul is free to fullfill it. The ex-Consul has got veto though unless 12/16 or more of the senators agree with the decission. (So if 8 are for and 8 are against the ex-Consul can still prevent the decission). This makes official decissions quite rare and often takes a lot of time before they actually happen, making the aristocrats private business the primary force behind expansion and such. EDIT; You think I should have them own a mining company? I've been winging it this whole time, so I really don't have much to work with.